A Koha user (from Tanzania!) asked today on the Koha mailing list, “I need some help on how to customize the staff client login page/replace koha logo with a new one.” I haven’t heard this request before, so it’s a good opportunity to investigate. If this were the OPAC we could use a system preference, opacsmallimage, to change the logo. We don’t have that option in the staff client, so we’ll have to see if we can use the available customization options to accomplish the same thing. The staff client logo is displayed using an image-replacement technique similar to the one used to display the Koha logo in the OPAC. The style of the anchor tag sets an explicit height which matches the logo image, and it sets a negative text-indent property which moves the text contents of the tag off the screen. These two properties create a blank space inside the anchor tag in which to display the logo. The style of the heading tag does the work of displaying the logo. The background property points to the URL of the logo image. In the default case this is an image file on the Koha server’s file system. The URL doesn’t have to be a relative one, though. It can be a full URL pointing to anywhere on the internet. The background-image of the <h1> tag. The height of the <a> tag. 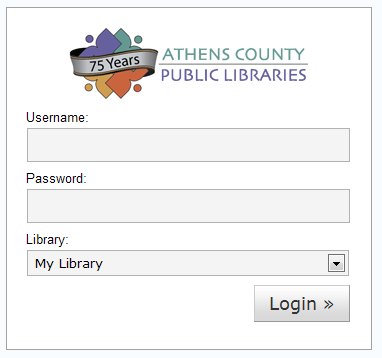 Let’s use as an example the logo on the Athens County Public Libraries site. I can right-click the image in Firefox and choose “View image” to find the details I need. The location bar shows the URL I need, and the title bar shows the dimensions of the image. I just need to note the height. We’ve got our custom CSS, now what do we do with it? We don’t have an opacsmallimage preference for the staff client, and we don’t even have an option like OPACUserCSS. We do have a couple of options which will work. If you have access to your Koha server’s file system you can add a stylesheet there and tell Koha to apply it in addition to the default staff client stylesheet. For example, you could create a new CSS file called custom.css and save it alongside staff-global.css and the other staff client CSS files. Then you can specify that filename, custom.css, in the intranetcolorstylesheet system preference. If you don’t have access to your Koha server’s file system, there’s a way to insert custom CSS into your staff client pages, but it’s a bit of a hack. Lacking an “intranetusercss” preference we’re going to hijack an existing preference, intranetuserjs, to do the job for us. Lines 6, 7, and 8 show the <style> tag we’re adding. This is where we’re going to put our custom CSS. Lines 9, 10, and 11 are the last lines of our custom intranetuserjs. Knowing that Koha wants to close the <script> tag it opened on line 1, we have to re-open a new <script> tag so that when Koha closes it we’ll have valid markup. This entry was posted in Koha, Koha Customizations and tagged CSS, Customization, Koha, staff client on July 21, 2010 by oleonard. Hello,good work there.I would also want to know how to change the intranet background color from the default that is white as well as change the fonts of the texts. Andrew, that’s pretty basic level CSS stuff. All the basic styles for the staff client are in /intranet-tmpl/prog/en/css/staff-global.css. You can use Firefox’s Firebug plugin to examine the page and see how the CSS works. Thanks. Does this work with Koha 3.2? Julius, as far as I know it should work with Koha 3.2.